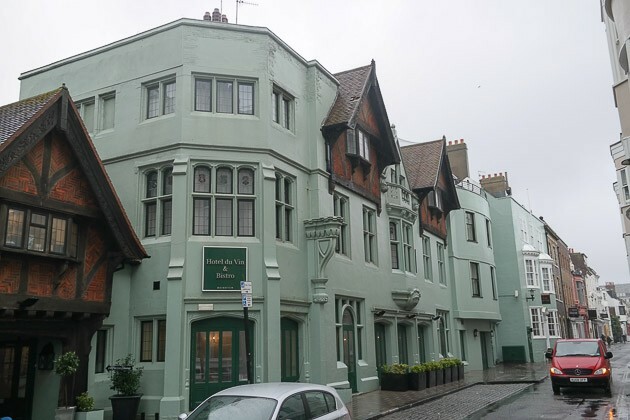 We had visited a Hotel du Vin before in Tunbridge Wells, so I was interested to find out how others faired. I booked the one in Sunday lunch at Brighton for the following Sunday. It was possibly one of the wettest days of the year when we arrived – absolutely tipping it down and very blustery. We parked close by, and were very happy to get into the warm and dry. We were met at entrance and shown to table in the corner of the restaurant. It was, once again, French Bistro style with hops, wine bottles, vin pictures, a wooden floor and tables laid out. Lighting was set a bit too low for such a gloomy day. Claire ordered a glass of processo, I asked for a lager. 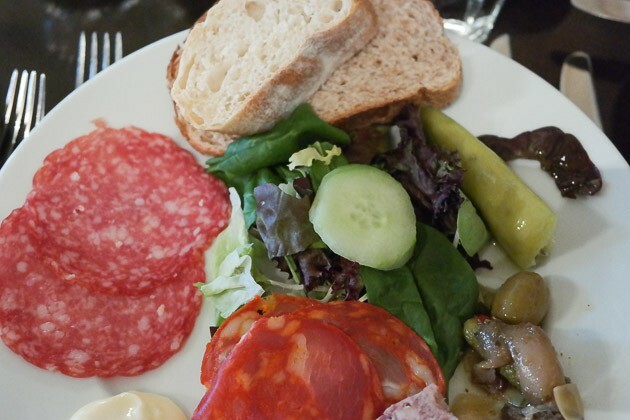 In the same way as Tunbridge Wells Hotel du Vin (and Mal Maison, funnily enough) there was a market table with lots of meats, along with smoked salmon and other sundries. It was situated just outside the restaurant, in the bar area – a bit of a shame as it was just too dark to fully appreciate everything. 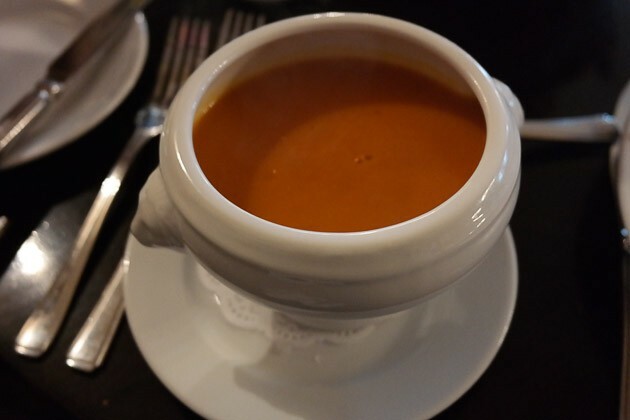 I also ordered the soup of the day, being tomato and basil – this was very thick and enjoyable; they had lots of different bread from the market table to dip. We also asked for a melon starter for JW, our toddler, as there wasn’t a gluten / wheat / dairy free offering. For the main course, I ordered roast beef served pink. 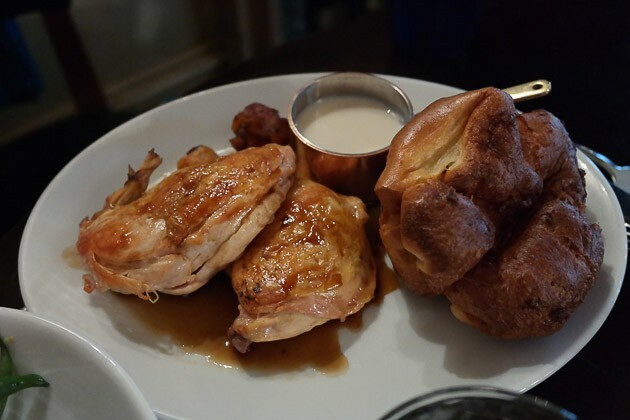 Claire asked for roast chicken, along with the same for JW. My plate consisted a few slices of pink beef along with a large Yorkshire pudding. I asked for horseradish, which was served to me. We had lots of roast potatoes and dish of veg – mange tout, cauliflower, broccoli, green beans and carrots. 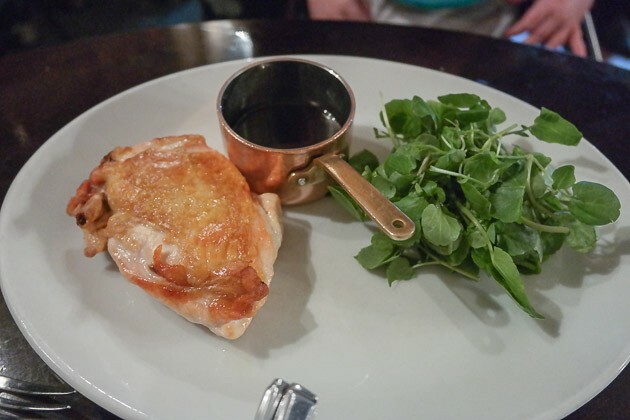 Claire had half a chicken and also bread sauce in a small saucepan. There was also lots of rich gravy. Tucking in, the potatoes looked like they had a lot of promise, being very crispy but they didn’t have any flavour (would have been nice to have had garlic and rosemary or just some seasoning). I tried Claire’s stuffing, it had a nice, lemony flavour. 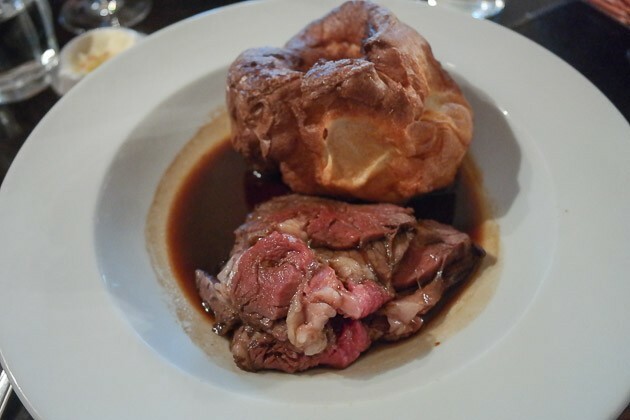 The Yorkshire pudding had a good texture and didn’t taste oily. The vegetables were cooked al dente – to my taste. Overall, a good Sunday lunch, on to the desserts. Claire ordered Profiteroles, I asked for the creme brulee. As JW couldn’t have anything from the main menu (due to allergies) we asked for a fruit salad for him instead. Also, a decaff coffee and a cappuccino (for us adults, obviously). Dessert was served fairly quickly. 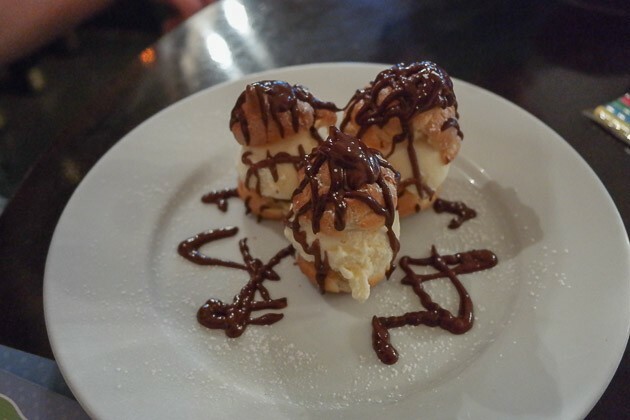 Similar to Tunbridge Wells, the profiteroles more like choux pastry with ice cream. It was nice, but not what Claire wanted (we only remembered the similar experience at Tunbridge Wells once it had been served). 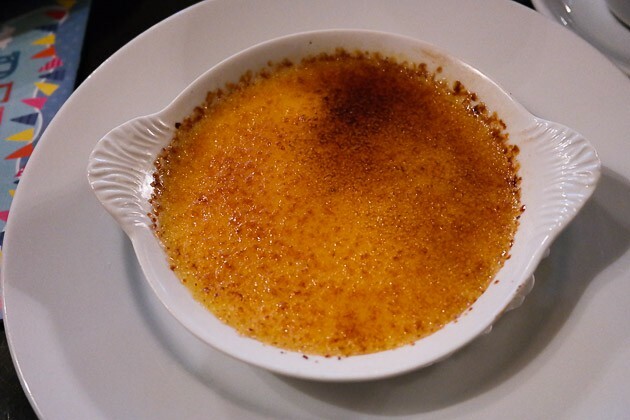 As before, the creme brulee had a good snap, very nice although the vanilla seeds, instead of distributed through the dessert, were mostly at the bottom of the dish. JW’s fruit salad was more a melon salad, but he enjoyed it. We did need to use some baby changing facilities, which were situated underneath a stairwell in the bar – in good repair and clean. 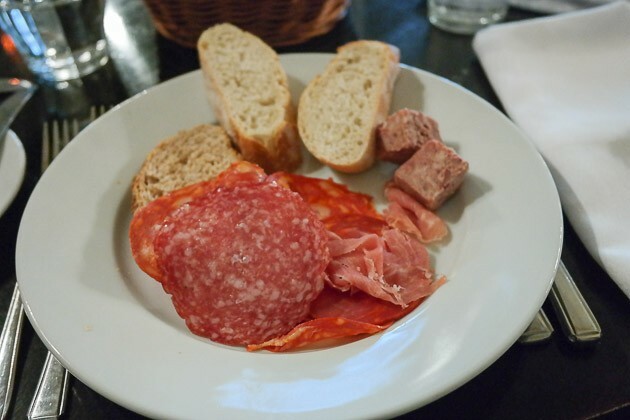 The menu price was superb considering you can go back continually with the market table – if we had a very hungry 6-7 year old, we would have really got our moneys worth! We were made to feel very welcome with JW, and there were families around the restaurant (without it feeling too much like a nursery). The service on the whole was excellent, very friendly and as mentioned made us feel welcome with JW. 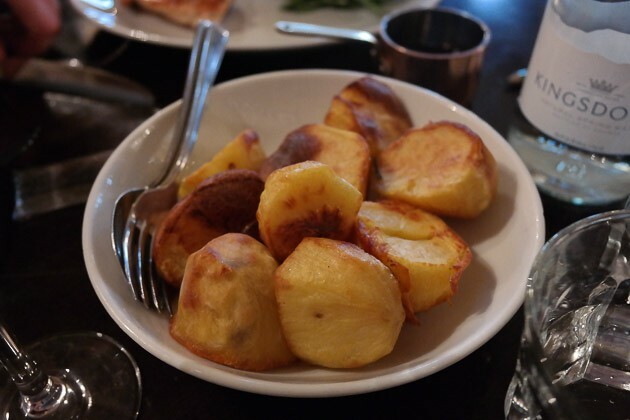 The food was good, the roast potatoes needed a bit of flavour but the vegetable selection, quality of the meat and gravy mostly made up for that. Certainly a venue to go to if you are extremely hungry – we felt it was good value at £24.96 for an adult and £9.95 for a child. Definitely one you could go for a celebration as well as for simple comfort food. 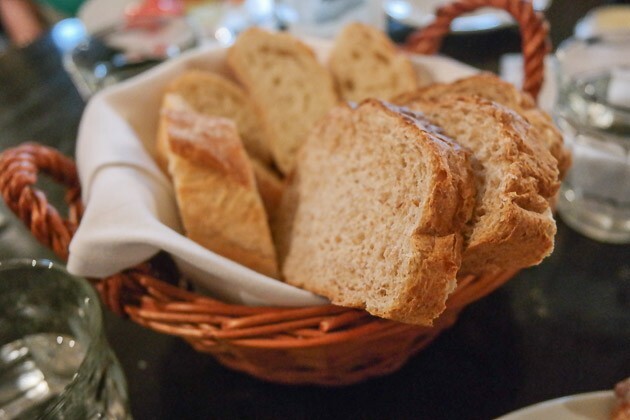 A couple of simple changes would make the venue higher scoring – as it stands though, the Bistro at Hotel du Vin scores a very good 4.5 out of 5.